The people who came to City Hall to protest the renewal of four West Baltimore liquor licenses – including the Oxford Tavern that was looted during the April 2015 civil unrest – had plenty of passion. “Enough is enough – we’re suffering,” said Rev. Keith Bailey, president of the Fulton Heights Community Association, describing loitering, stabbings, police activity and other problems he sees at the Oxford, living across the street from the 1741 West North Avenue establishment. The critics also had deep roots in the community. Documentation to show number of police and 311 calls, previous Liquor Board violations, eyewitnesses who can attest to dates and times of alleged acts of public urination, drug dealing, etc. Also required: 10 signatures from people or property owners “in the immediate vicinity” of the establishment. None of the protests had much more than 10 names and the lawyers picked them apart. “We have three signatories out of the 12 who live more than two miles away” from the Oxford Tavern, said its attorney, Steve Fogleman, the former Liquor Board chairman. The current board hasn’t formally defined its interpretation of “immediate vicinity,” Chairman Albert J. Matricciani Jr. said to Fogleman. But he told the Oxford’s protestants – and all of the protestants before the board yesterday – that their efforts fell short due to lack of detail alone. “I don’t doubt the veracity of anything that any of you have said, but it’s too general for me. I need specifics,” Matricciani told the four people who spoke against Uptown Liquors. 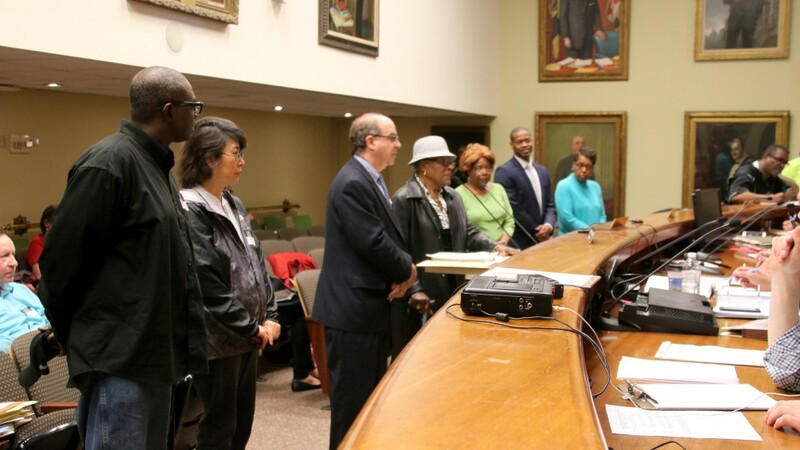 He and fellow commissioners Aaron Greenfield and Harvey Jones voted unanimously to renew the Oxford’s license, as well as those of: Uptown Liquors, at 2115 West North Avenue; Whispers, at 1807-11 Baker Street; and Mel’s Liquors, at 1813 Pennsylvania Avenue. For Liquor Board insiders, this year’s license protests, an annual ritual at the agency, were strange in a number of ways. The language used in the applications to describe the complaints against the four establishments and the names of the people complaining were nearly identical. And, as the lawyers pointed out, signers came from as far as four miles away. The protests were filed with the Liquor Board on the deadline day, another odd feature considering that the office of Mayor Catherine Pugh seemed to have taken an interest in them. Becky Witt, a Community Law Center attorney who has represented communities challenging license renewals, said she was asked for help at an extremely late juncture in the process. “I was approached by Alli [Alexandra Smith, of the mayor’s office] after the deadline, after they’d already submitted the petitions. I met with her April 5,” Witt said. 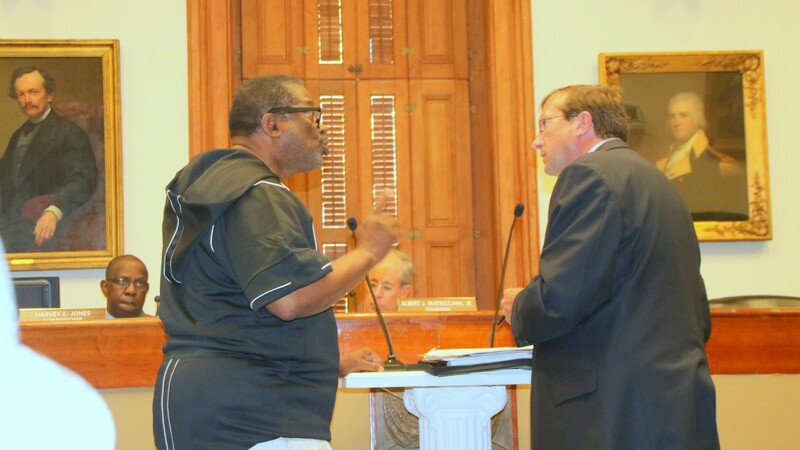 A staffer for Councilwoman Shannon Sneed also confirmed that Smith had been discussing a possible challenge to an establishment in the 13th District, but that it had been rejected for lack of signatures from adjacent homeowners. “There were too many vacant addresses in the immediate area around the place,” said Sneed aide Gabriel Sikowitz. Determining who initiated the multi-licenses attack was further complicated by the fact that none of the people who signed the petitions showed up at the Liquor Board to testify yesterday. Matricciani referred to them at one point as having been organized by the Matthew Henson Neighborhood Association. The name of the group’s president, Tiffany Welch, appears on three of the four petitions. An email to Welch, daughter of former Councilman Pete Welch, bounced to a vacation responder that referred questioners to Sean Owens, of the No Boundaries Coalition (his name was also on some of the petitions) and to a “Ms. Powell,” of the Matthew Henson group. Neither has responded yet to The Brew. Inez Robb, who testified at all four protest hearings, said she’d heard about liquor store concerns from members of the Matthew Henson Neighborhood Association group and at the monthly meetings of the Western District Police Community Relations Council, which she heads. “We talk all the time about how these places cause so many quality-of-life issues,” said Robb, who is also president of the Fulton Community Association. Councilman Leon Pinkett, who also testified against the establishments, said he heard about the license protest process from Welch. Citizens and a councilman weren’t the only ones joining the protest against the establishments. Detective Abraham Gatto, of the Baltimore Police Department, said he came to back the protestants up. Looking in the department’s database, Gatto found 15 “disorderly persons” complaints called in to the Mel’s Liquors address. The reports were for people gathering outside the establishment, loitering and drinking on the sidewalk, he said. Meanwhile, on hand in the audience to support the tavern and bar-owners yesterday was a licensee himself – Domingo Kim, whose tavern on York Road has been before the Liquor Board on multiple occasions. “I’m just here to help them,” said Kim, who recently became the president of KAGRO, the Korean American Grocers Association of Maryland. In May 2014, the Liquor Board, under then-chairman Thomas Ward, found Kim’s Stadium Lounge in violation of the state liquor laws for making illegal payouts on video slot machines. The tavern was fined $9,000 and ordered shut for six months, a suspension that the board, under incoming chairman Benjamin Neil, cut short after two months. In November, the lounge’s license was renewed, with conditions. Among those weighing in on the liquor protest was former Matthew Henson Neighborhood Association president Marvin L. “Doc” Cheatham, who did not attend but sent a letter to the board in support of one of the licensees. Speaking later with The Brew, he criticized Welch for organizing the protests. “It infuriated me,” said Cheatham, who argued that the current licensee at 1807-11 Baker Street, formerly The Old Clubhouse, does not cause neighborhood problems. “That licensee is really trying to do right,” Cheatham said, noting that the bar is in the same block as the new playground Cheatham just got built, the Easterwood/Sandtown Park and Playground on McKean Avenue. “He’s let us use his bathroom, he’s given us cases of water – anything I tell him we need he gets,” said Cheatham, who now heads the Matthew Henson Community Development Corporation. During his defense of the Oxford Tavern, Fogleman pressed the establishment’s critics, producing photos from the recent playground ribbon-cutting that showed the Mayor and other VIPs attending. He asked across-the-street neighbor Bailey if he wasn’t aware of “the financial and other contributions” of the licensee to the local elementary school and the community and to the event kicking off Cheatham’s project. “You are not aware of the snacks and drinks he provided?” Fogleman asked.